Healthier Pineapple Upside Down Cake. 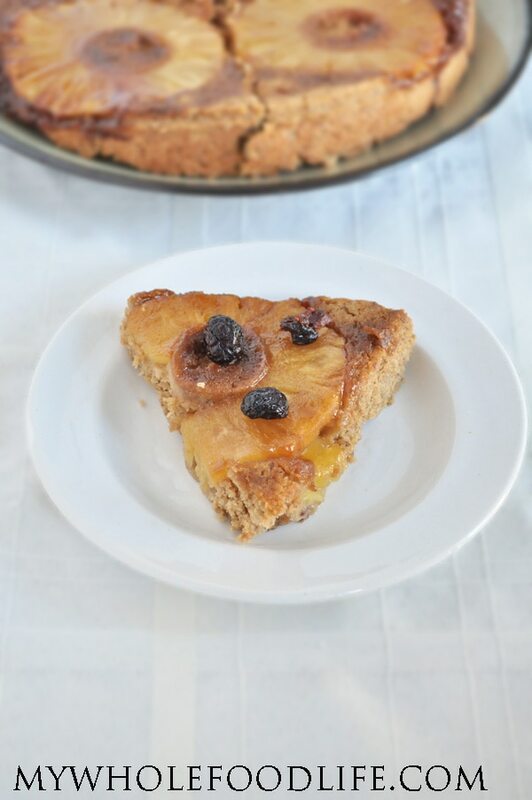 This pineapple upside down cake is made healthier with whole grain flour and no refined sugars. It’s also vegan and gluten free. This healthy pineapple upside down cake is super easy to make too! I was amazed at how rich and buttery it tasted. The pineapples caramelize during the cooking process so they are super sweet and juicy. I used coconut butter instead of butter and it came out great. I don’t think you could taste the coconut at all. Just caramelized pineapple deliciousness! I have also used coconut butter in my lemon blueberry cookies. I used sorghum flour in my pineapple upside down cake because I like the cake-like texture it produces. It’s great in my pumpkin chocolate chunk cookies. I am sure you can probably use gluten free oat flour as well. This takes no time at all to make and your kitchen will smell amazing! I know traditional pineapple upside down cake calls for maraschino cherries, but I didn’t want to use those since they are not healthy at all. I garnished mine with dried cherries after it was cooked. You might also be able to use frozen, thawed cherries. Or you can just leave it plain. The classic cake made gluten free and healthy! Pour the melted coconut oil in the bottom of a cake pan. I used a 9 inch spring form pan . Brush a little oil up the sides of the pan as well. Sprinkle the coconut sugar on top of the oil, and then add the pineapple rings. Lay the rings side by side until the bottom of the pan is covered. I used 5. In one bowl , mix all the dry ingredients together and set aside. In another bowl , cream together the softened coconut butter and coconut sugar. Then add the vanilla, almond milk and flax eggs. Lastly add the dry ingredients and mix only until combined. The batter will be pretty thick. Spread the batter on top of the pineapple rings. Make sure they rings are covered evenly. Wait until the cake has cooled for at least 15 minutes before you remove the sides of the pan and turn it over. This cake should last at least 5 days in the fridge. Enjoy! I love pineapple and just bought more coconut butter. The ingredient list is awesome :) im focusing i. Eating whole unprocessed food so this is great! Oh will have to try this soon. Thanks for sharing! This looks delicious! My sister-in-law went gluten free a month ago and has not only lost weight but her skin has cleared up and she feels much better. I still haven't gone totally gluten free but after seeing her positive results, I've been seriously considering it. With recipes like yours, it would be a lot easier to transition. Thanks for being an inspiration!! What are the calorie count, fat count, salt count, and so on...? I am sorry, I don't know. You can probably figure out a rough estimate on My Fitness Pal. I wanna make but I don't have coconut butter . I want to keep it vegan and gluten . Do you have any suggestions what I can use ? You can try vegan butter like Earth Balance? Can honey or maple syrup be used instead of coconut sugar? can I substitute the coconut butter for applesauce? You may be able to do that, but the result may be slightly different.